Flower Hooded Towel Discounts Apply ! 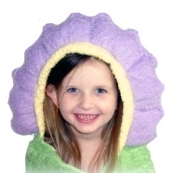 The Flower Hooded Towel is petal perfect! The 100% cotton, 30"x54 towel in colorful spring colors makes a precious baby shower gift, and is fun enough to bring years of fun and enjoyment at the pool, at the beach, and of course - at bath time.